California has a very complex water system which is important to many often competing interests and purposes. Because of this, California’s water system will always be controversial. Nevertheless, decisions about managing California’s water system will be made. How can we understand the complexities of California’s water system and develop a better technical understanding to aid discussions leading to better management and policy decisions? Tanaka, S.K., C. Buck, K. Madani, J. Medellin-Azuara, J. Lund, E. Hanak (2011), “Economic Costs and Adaptations for Alternative Regulations of California’s Sacramento-San Joaquin Delta,” San Francisco Estuary and Watershed Science, Vol. 9, No. 2, 28 pp., July, 2011. 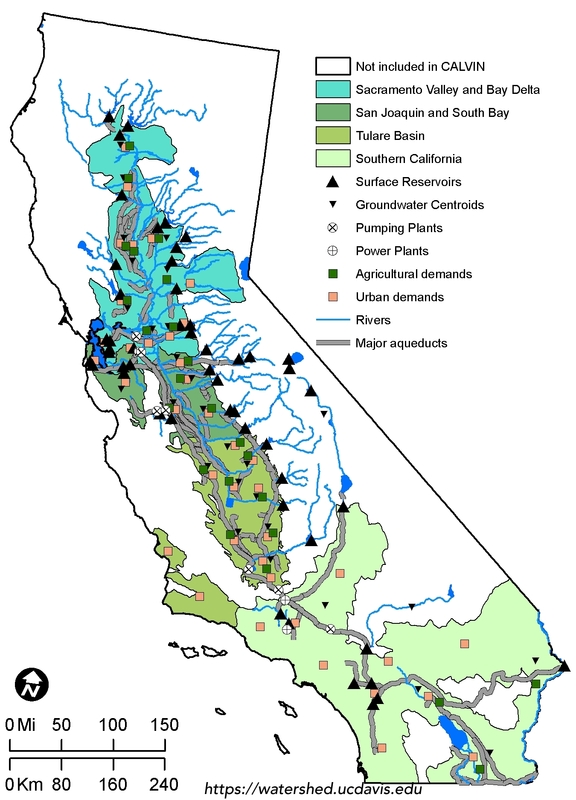 This is a refereed publication of work on long-term (2050) statewide water supply costs and economic adaptations to various approaches to reducing or eliminating water exports from the Sacramento-San Joaquin Delta. Sicke, William (2011), “Climate Change Impacts to Local Water Management in the San Francisco Bay Area,” Master’s thesis in Civil and Environmental Engineering, University of California, Davis. Mr. Sicke’s thesis focuses on how the various Bay Area water suppliers might adapt operationally and economically to very severe reductions in water availability due to changes in hydrology and Delta exports. Bartolomeo, Eleanor (2011), “Economic Responses to Water Scarcity in Southern California,” Master’s thesis in Civil and Environmental Engineering, UC Davis. Ms.Bartolomeo’s thesis updates the CALVIN model representation of southern California for 2050 (mostly using the 2005 Urban Water Management Plans), along with other substantive improvements, and then explores water supply costs and adaptations for this region with various levels of water export from northern California. These are all interesting pieces of work in their own right, by outstanding young water engineers who will be assets to California for many years to come. Each study provides its own lessons, but since they all came out within a few months, some overarching lessons can be drawn. 1) Modeling analysis, even optimization, organizes technical and economic details to provide a reasoned understanding of the potential of the system to support water management objectives under a range of conditions. Such modeling helps us better look into a hazy future which is likely to differ from our past experiences and intuitions. 2) Although modeling is helpful and often insightful, models are imperfect and cannot solve problems alone. Solving problems requires people. Optimization models show what people could do, not what they will necessarily do. The numbers from a model are less important (and less reliable) than the qualitative lessons and insights that emerge from thoughtful modeling analysis. 3) California inadequately assembles information on water supplies, demands, costs, and environmental impacts to support useful modeling and water accounting. The state does a nice job in some areas, has some awesome hard-working individuals working on many pieces, and has some elaborate models of the state and federal project surface water deliveries. However, the only long-term statewide integrated analyses (including surface and groundwater, diverse and integrated statewide and local supplies, environmental flows, economically quantified demands, operating costs, and optimization to explore it all) are done by university graduate students and researchers. 4) Local governments, aided by requirements for Urban Water Management Plans (updated every 5 years), now provide better urban water use data than is available from the State of California. Alas, the State has been unable to compile into a common database or employ this collection of increasingly useful reports. 5) Water markets, integrated reoperation of groundwater and surface water storage and conveyance, along with local water reuse and conservation make California’s water system very resilient to large changes. Even severe changes in climate and population growth, can be accommodated fairly well statewide and for most regions. These changes are often costly, but they are almost never catastrophic if they are well-managed, as water users and managers strive to respond intelligently. Sometimes costs are high enough to justify new local or regional infrastructure. 1) Southern Central Valley agriculture and rural farm-based towns are particularly susceptible to the loss of Delta water exports and potential climate drying due to climate change. Their losses would not be catastrophic for the state’s economy, but would likely be catastrophic locally. 2) Urban water conservation is quite useful for responding to adverse water supply changes. However, conservation is no panacea, and will have significant costs (like anything else). As such it deserves serious–and unromantic–treatment. 3) The Bay Area has had the foresight to develop interconnections among its major water providers in recent years. These interconnections can help Bay Area water systems adapt to severe changes in climate and infrastructure, avoiding potential catastrophe, despite substantial costs. Those feeling a need to argue with these conclusions will support my final point: the state needs a better data management and analytical framework, with models and more insightful analysis than those developed by graduate students and professors. We will never advance unless we move forward with greater state technical capability and willingness to explore and develop solutions to California’s water problems. Failure to create a credible and widely regarded state technical program will continue to invite the cultivation of myths and misconceptions which distract water management discussions in California. But these and other fine young professionals are in our future, so there is hope if there is will. Late-breaking CALVIN model News: The American Geophysical Union’s Water Resources Research journal awarded an earlier CALVIN modeling paper (featured in CaliforniaWaterBlog.com) an Editors’ Choice Award, given to the top one percent of published articles in any calendar year. The selection is made by the WRR Editors based on technical significance, novelty, originality, presentation, and broader implications of the publication. Julien J. Harou, Josué Medellín-Azuara, Tingju Zhu, Stacy K. Tanaka, Jay R. Lund, Scott Stine, Marcelo A. Olivares, and Marion W. Jenkins, “Economic consequences of optimized water management for a prolonged, severe drought in California,” Water Resources Research, 2010, Vol. 46, W05522, 12 pp. (doi:10.1029/2008WR007681). Jay R. Lund holds the Ray B. Krone Chair of Environmental Engineering at UC Davis. This entry was posted in California Water, Planning and Management, Water System Modeling and tagged California, Delta, Jay Lund, UC Davis Center for Watershed Sciences, water conservation, water management, water modeling, water planning, water supply. Bookmark the permalink. Pingback: dj-wonk comments on "El Niño vs. the Drought"